In 2007, Jasper National Park will honor its past and look toward its future as it celebrates 100 years of cultural and natural history as a protected place. To commemorate such a milestone, Jasper National Park is planning one hundred days of celebration. Centennial celebrations will include exhibits, events, publications, a centennial documentary, learning opportunities and the creation of various legacies. It’s an opportunity for all to learn about Jasper’s natural and cultural heritage, and how to become better stewards of all protected places. It is a unique time to feel the power of our landscape and the richness of our past, and to commit to our future. In 2007, Jasper National Park is the place to be. Visit Jasper National Park’s Centennial Celebrations’ website,www.jasper100.com, for a complete calendar of events. In 1930, the National Parks Act is passed and Jasper is officially established as a national park. 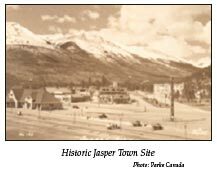 And in 1931, as a relief project for hundreds of men, work begins on the Jasper-Banff Highway. The road (known nowadays as the Icefield parkway) is completed in 1940 ? just in the nick of time, as the nation’s resources are soon fully devoted to World War II. Jasper Park Information Centre National Historic Site of Canada (500 Connaught Drive) In 1913, Jasper National Park superintendent, Lieutenant Colonel Maynard Rogers, was overseeing much of the early development of the Jasper townsite. He had visions of a unified architectural theme for the town, believing local materials and building methods should be used. Completed in 1914, the Jasper Park Information Centre originally housed park administration offices, a museum, a fish hatchery, and living quarters for the park superintendent. Designated as a Federal Heritage Building in 1992, this picturesque fieldstone park building is now one of the finest and most influential examples of rustic architecture in Canada’s national parks.